New York Comic-Con took place over the weekend and the types of shows it attracted went beyond the usual sci-fi and fantasy offerings that you might expect from this kind of event. So while Netflix took the opportunity to show off photos and footage from Daredevil you could also catch up with the Broad City ladies and the spies from The Americans. While not on the same scale as SDCC, there is still plenty for us to pour over including the aforementioned Daredevil debut (alas the footage was for attendants only). Comic-Con attire tends to straddle cute/casual/relaxed and the dress code is neither one specific thing nor another. Even a jumpsuit makes the style hit list. 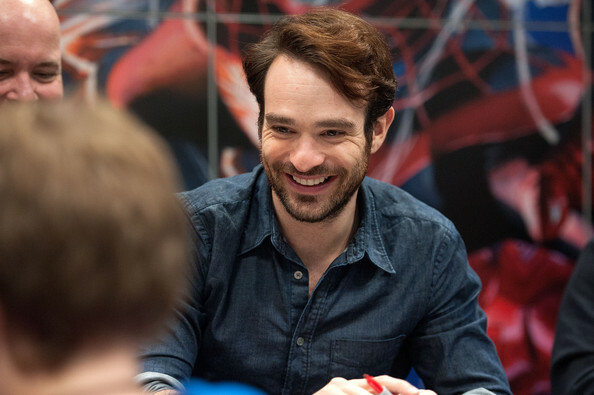 Let’s start with Daredevil and Charlie Cox will be taking on the Matt Murdock mantle on Netflix (no release date yet); here he is working the super smile, beard and a denim shirt. The reddish toned hair is all part of the Matt Murdock look and Cox landing this lead role has me very excited about this project. Plus his time on Boardwalk Empire showed he was capable of playing both the fearsome and romantic side. If only he could use the Owen Irish accent on this show. 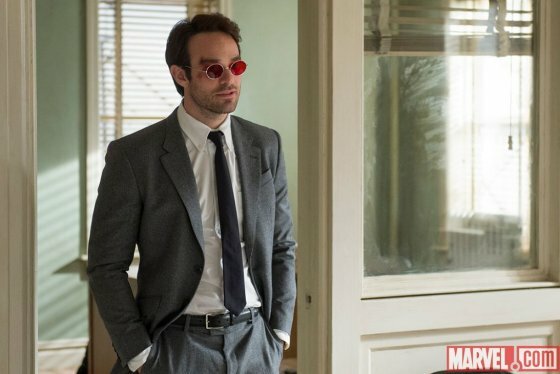 And this the first still of Cox all lawyer suited up as Matt Murdock. This is some pretty damn good tailoring and he is wearing it well, along with signature red tinted specs that have a hint of John Lennon. Swapping Bon Temps for Hell’s Kitchen is Deborah Ann Woll; I am thrilled to see her score something like this after True Blood and I hope she gets to be more than just a love interest. A simple chic cornflower blue dress and the slightly different toned blue sandals avoid matchy matchy status. The Americans cast and showrunners didn’t reveal much of anything about the next season (which starts shooting this week), but they did wear matching ‘Commie Con’ t-shirts (Matthew Rhys’ idea) compete with the ‘C’ as a hammer and sickle. Both Keri Russell and Annet Mahendru jazzed their looks up; Russell staying all black with a leather mini, blazer and stilettos and Mahendru rocking boots and the lip embellished Alice + Olivia skirt (also worn by Jamie Chung at NYFW). Bonus Americans panel shot with a closer look at the bespoke tees. And because they are adorable. Abbi and Ilana! Another occasion where Abbi is my style twin (I have a very similar French Connection dress) and Ilana is my style hero in a shirt that’s making me think of a Care Bears color palette. Thankfully there is “Hack into Broad City” to tide us over until January when Broad City returns. A jumpsuit I like is rare, but Aisha Tyler’s blue slouched drawstring number is giving me all the positive feelings. Pockets plus red shoes and a bold lip color all add up to a very good outfit and strong style week for Tyler. Tyler’s Archer co-star Judy Greer has also opted for crimson footwear and the all-black button down shirt and suit look is working, in part thanks to this splash of color. This also reminds me that I still need to read Greer’s I Don’t Know What You Know Me From: Confessions of a Co-Star. Going for monochrome is The League’s Katie Aselton in a simple chic black cropped sweater and a white skirt. This would come with a no drinking or eating warning due to spilling reasons. Confession – I have a bit of an eyebrow obsession and it’s always the first thing I notice about someone’s face (a timely essay from the Hairpin regarding eyebrows) and Sleepy Hollow’s Lyndie Greenwood has excellent eyebrow game and it is very evident here (this is for excellent shape and eyebrow expression usage). Peter Pan collar shirt and side braid completes this cute Comic-Con ensemble.